Kristen and Courtney have teamed up again to bring you yet another amazing post. This time – we are dishing on all the fitness gadgets and gifts we hope to receive on May 10th – Mother’s Day! But before we get into our list…. Let’s start out with some opining on that glorious holiday dedicated to moms…. It typically is just another day for me even though I have been a Mom for 2 years now. Hopefully my husband will read this post and he will knock it out of the park this year! I will let him off the hook considering I have spent the past two Mother’s Day working at a local restaurant that I have worked at for over 10 years- hard to spoil me when I am gone most of the day. This will be my first official Mother’s Day. All though, the record should reflect that I was pregnant last year over Mother’s Day – and despite my pleas to Jimmy that pregnancy counts – the day passed without being lavished with gifts. Jimmy usually brings his “A-game” and lots of thoughtful gifts – so I am sure he will make my first Mother’s Day memorable. And if you are reading this Jimmy – no pressure – but don’t let the readers of this blog down! 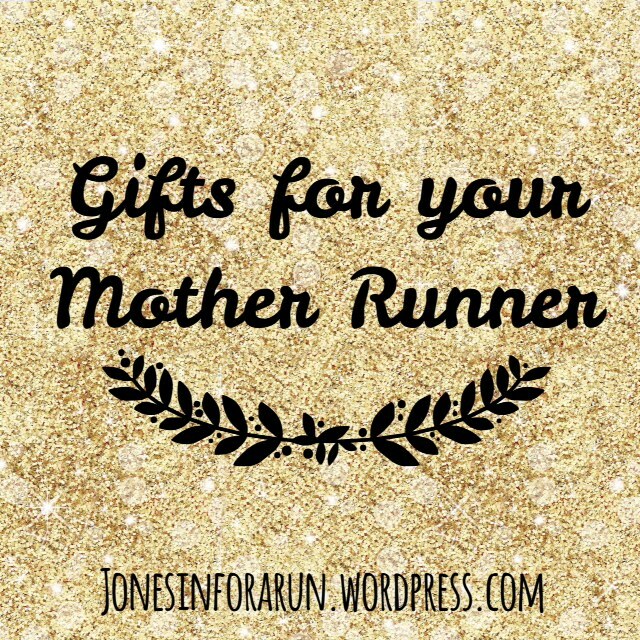 So with that – here are some perfect Mother’s Day gifts for your running mammas, wives, sisters, and sole mates! Order Race Photos from a past event. Truth #1- Race photos are crazy expensive. Truth #2-Sometimes we love our race photos but they are just too expensive so we never buy them Truth #3- It would be awesome to get our race photos as a gift. Sessions to a specialty fitness class like Hot Yoga or Barre Fitness. I used to love going to Hot Yoga until I realized it was totally cray-cray to pay my monthly gym membership PLUS play for sessions to go to Hot Yoga. Having a punch pass to attend these classes would be PERFECTION wrapped in a box (for me anyway). New Running Shoes. DUH! While I would NOT suggest going to the local sports store and buying the “best-looking” or the cheapest running shoes available what you could do is have a pampering day for the special mother in your life. You could treat her to a pedicure and take her shopping to find a new pair of running shoes of her liking! Athleta, Athleta, Athleta. I cannot recommend this brand enough! Every woman wants to feel cute and comfortable while working out – and Athleta accomplishes both goals! I would recommend the Chi Tank. It comes in so many colors and two length options – regular or long – in case your mamma likes her derrière covered. The Chi Tank is also “quick drying” after a sweaty session and contains “Unstinkable” technology. I am not sure what exactly that is…. But I can attest that after numerous sweaty cycling classes – my chi tanks doesn’t smell! Hallelujah! Gift certificate for a pedicure. You can never go wrong with a pedicure. A pedicure gift certificate accomplishes two things. #1 A solid hour of Mommy alone time and #2 those toes will be sandal, flip flop, and beach/pool ready! Remember – we are here to help all those lost and helpless husbands & kids buy their mother runner the perfect Mother’s Day gift! Need a personalized idea? Drop us a comment and let us help you out. While a sweet card and even flowers are always a welcome idea – we hope you check out some items on our list and let us know what you think! Hey if you accidently forward it to him what is the worst that can happen- you have the best Mother’s Day ever??! !